Huge Life Size Animated Realistic rustic design toy prop faux Chainsaw cosplay costume weapon. Great accessory for zombie hunter monster slayer serial killer horror costumes! Aged Black Fake Chainsaw has a rusty-looking old faux blade. 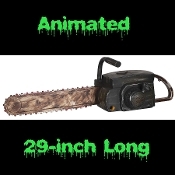 Plastic blade rotates and you hear realistic chainsaw sounds! Made of safe plastic. 29-inch long x 8-inch wide x 8-inch deep (72.5x20x20cm). YES, includes 4-AA demo batteries. *This item must be shipped separately, so cannot be combined for discounted shipping. YES... This item ships WORLDWIDE!! !